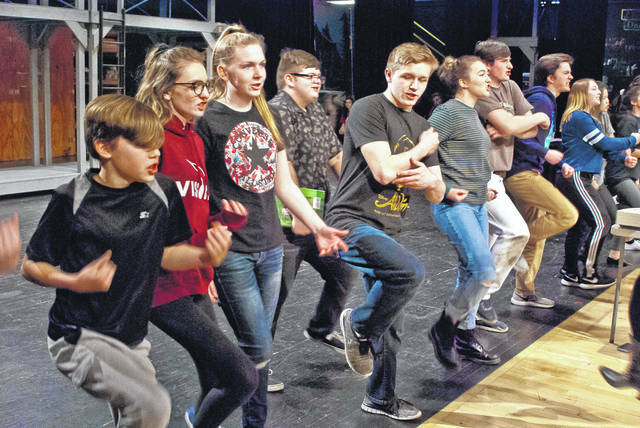 Buckeye Valley High School Troupe 6950 is currently in rehearsals for the high energy musical, Disney’s Newsies: the Broadway Musical. The non-stop shop promises to have lots of props, singing, and dancing telling the story of the 1899 Newsboy’s strike in New York City. Before the cast and crew broke for spring break this week, Emily Kirtland the director said the goal was to perform the show from beginning to end so they would n’t be starting from square one the first week back. The cast and crew of Buckeye Valley High School Troupe 6950 will present Disney’s Newsies: the Broadway Musical for three shows April 12-14. The high energy non-stop musical Newsies: the Broadway Musical is based on Disney’s 1992 film, Newsies. The movie was inspired by the historical Newsboys strike of 1899 in New York City. The show’s music is by Alan Menken, the lyrics are by Jack Feldman, and the book is by Harvey Fierstein. Currently, like most school districts in Delaware County, the Buckeye Valley Local School District is on spring break. When the cast returns they will have less than two weeks to rehearse the nonstop fast-paced musical. But, Kirtland doesn’t seem worried about the loss of rehearsal time because she said the week before leaving for the break the cast pushed hard so they could do the show from beginning to end. Kirtland said the show is prop-heavy with a lot of set pieces that move in and off of the stage during the show. Kirtland said the show isn’t lacking in the set department because of the Buckeye Valley parents. Kirtland said the core parents that are there every day do whatever it takes to put the show together. But, Kirtland said she is short on cast members. Kirtland said she has had to improvise by “plugging in” crew member to be cast members as well. Kirtland said she has been a vocals teacher in the Columbus area for 14-years and started directing musicals about 8-years-ago. She said Newsies is the first musical that she has been in charge of from the top down. Kirtland runs a nonprofit theatre company in Columbus, Ohio Musical Theatre Institute (OMTI), which she said is now in its third year. “We’re a nonprofit educational theatre company, a baby company,” she said. Kirtland is also the musical director for a show being performed at Westerville South High School and an assistant vocal director for a show at Pickerington High School North. “I’m hoping to really blow the school’s socks off when they see it,” she said. • Friday, April 12 — 7:30 p.m.
• Saturday, April 13 — 7:30 p.m.
• Sunday, April 14— 2:30 p.m. This entry was tagged Buckeye Valley High School, D. Anthony Botkin, Emily Kirtland, Newsies: the Broardway Musical, Troupe 6950. Bookmark the permalink.